Oh my gosh!! This sign is so soft creamy and romantic. I painted the background a creamy off white crackle then distressed it a bit. 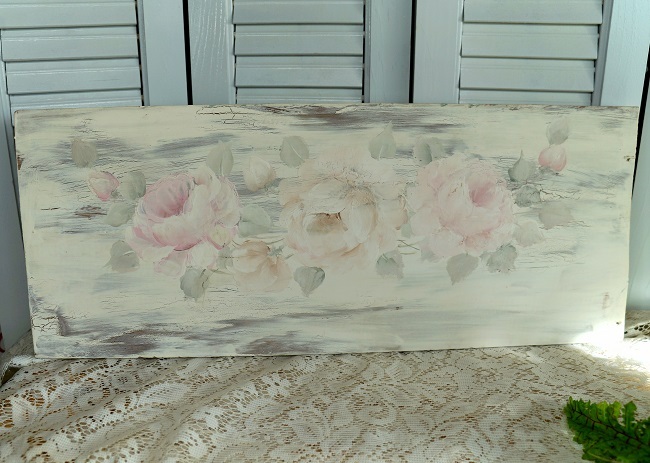 I hand-painted soft faint faded roses in shades of pink and a cream beige added foliage in shades of green . So romantic, country, farmhouse chic. This is painted on a Salvaged piece of wood. a one-of-a-kind, perfectly imperfect. It is appx. 7 1/4'' x 18'' signed and dated.